The Vermont Lakes and Ponds Program has released updated information on the management of aquatic invasive species. In 2017, the Legislature enacted new rules designed to protect water resources, prevent infestations and spread, initiate rapid response where feasible, and minimize the economic and environmental impacts of aquatic invasive species. Timing – early response to new infestations is key to successful control; an Aquatic Nuisance Control Permit may be required. 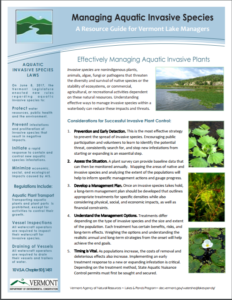 If you’re interested in aquatic invasive plant management, check out the new 10 page guide.